David gives several workshops around the countries of different elements of landscape painting and his Skies Workshop is enormously popular. 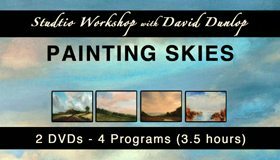 This Painting Skies DVD is intended for landscape painters interested in learning new information and different techniques for painting skies and expanding their painting skills and their background in art history.Using techniques of the old masters as well as contemporary methods, David Dunlop brings you a wealth of information, demonstrations, encouragement, tips, and insights in this 3.5-hour DVD. Learn new methods to dramatically improve your eye, your composition, painting and you landscapes. Each program will have two sections. David will begin by discussing and diagramming the design and composition of several relevant paintings by a range of different artists, including Claude, van Ruisdael, Turner, Constable, and the Hudson River painters – as well as contemporary painters. Next, he will demonstrate how van Ruisdael and Turner painted their skies in several of their paintings, discussing every step of his painting process along the way. He will paint an original painting in the Skies in Motion and Luminous Skies programs, showing how you can incorporate these techniques into your own unique style. David examines, discusses and outlines the design of vanRuisdael’s masterful painting The Wheatfield. He discusses the different considerations for designing higher and lower perspectives for landscapes and then paints a demonstration exploring how van Ruisdael painted his voluminous skies. David examines, discusses and paints a study of Turner’s beautiful View of Venice: The Ducal Palace, Dogana and Part of San Giorgio, painted in 1841. He examines the techniques that Turner used to paint luminous skies and water in the Venetian landscape. David discusses the structure and design of the painting and demonstrates a drawing of his design. David then paints his plein air painting of the scene, demonstrating many painting techniques for shaping, toning and creating texture in a painting. David demonstrates how to paint a luminous sky against a subtle background. He paints the very subtle gradations of color in a glowing backlit (contre-jour) sky and discusses the delicate touches and palette necessary to create this landscape.